If you are out of Thailand for whatever reason, sometimes it may not even take long to find new Thai friends in your city. California especially has always been a popular place for young Thais to make first experiences working or traveling in a foreign country or American guys that marry their Thai girlfriend and take them back home to live there together. But it’s not just America’s sunshine state that attracts more and more open-minded Thai people, if you look around the world, Australia, Japan, parts of the Middle East and of course Europe (basically the countries that account for the majority of foreign visitors to Thailand) it’s a lot more countries these days Thais are seeking to stay in. In fact, out of 70 Mio. Thai people an estimated 123,913 Thais (1.77%) are temporarily or permanently living abroad in 88 countries around the world. 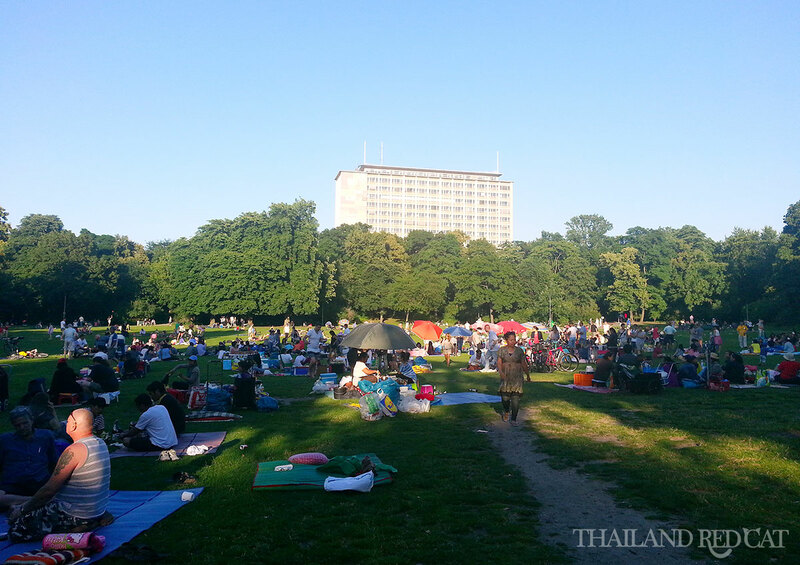 A great opportunity for getting in touch with a big and thriving local Thai community abroad is the so called “Thai Park” in Berlin, Germany. Officially known as “Preußenpark” in the city’s central district of Wilmersdorf, this is where dozens of Thai people come to hang out during the warm time of the year (roughly May to September) and nice weather any day of the week from afternoon till late in the evening. What you can experience there is pretty much one of the most open, casual and fun Thai style places outside of Thailand. The first time I have been there this summer I was quite surprised. I knew that people called this park “Thai Park”, but I couldn’t imagine how true and appropriate this nickname for one of Berlin’s numerous parks really is. While walking around for the first time I really didn’t feel myself to be actually in Germany. Dozens of Thai women selling all kind of Thai food that they prepare and cook on the spot, just like in any market in Thailand. With the difference that here they are sitting on a matt on grass while in Thailand they usually have their own food both in form of a car, sitting on plastic chairs while waiting for customers. While walking around and being delighted about all the authentic Thai food from Dom Yum Gung, Dried Fish and Satay to Papaya Salad, it was also funny and kind of surprising as most of the food vendors asked me in German if I want to try some of their dishes. As I started talking to a few of them it turned out that most of them were married (or some divorced) with a German guy that often sat next to them selling drinks – even Singha and Chang beer! While that’s true, I still know a lot of people who enjoy the cold winter in Berlin just because it’s always so hot in Thailand. 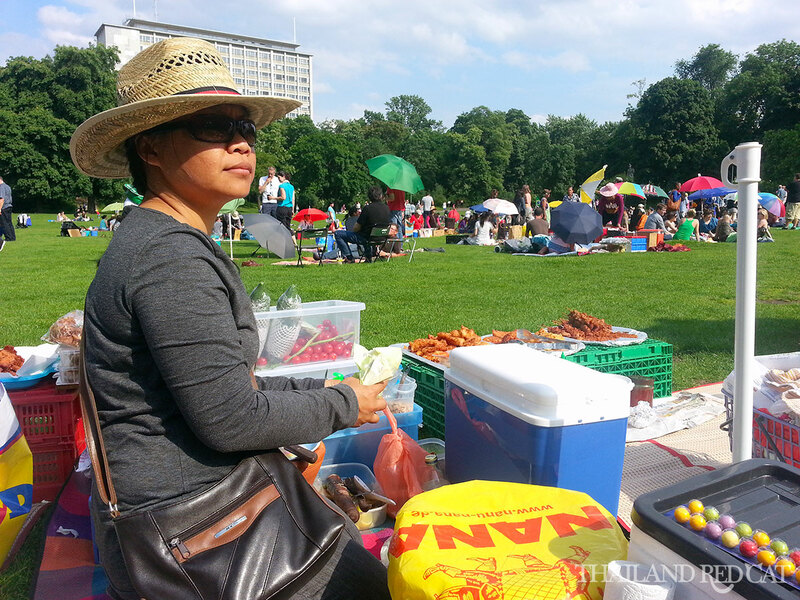 Many Thais like her who sell food in the park for five or six months can save enough money to fully support their families back home or even open a Thai restaurant in Berlin. 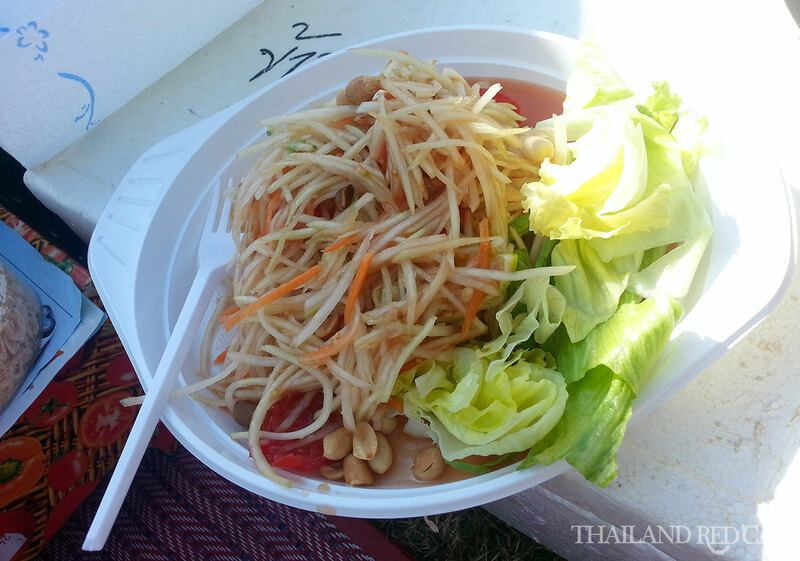 The general price for the “main dishes” in the Thai Park is 5 Euro (e.g. Papaya Salad) and 1 Euro per one piece of the smaller food (e.g. Satay). Sure that’s pretty expensive compared to Thailand where you can get a fine Papaya Salad in the food court of any shopping mall for 35 or 40 Baht. But then this is Germany not Thailand, the women here have to pay slightly more for the imported ingredients and also have higher costs of living than back home. There are some Filipinos, Indonesians and Chinese people as well but that’s not more than like 5% of all the Asians in the Thai Park Berlin and believe it or not, usually there are more Thai people on the green than Farangs, just the other way around to Khaosan Road in Bangkok during daytime. Most of the Thais here have a German partner, are divorced, or in the case of a lot of younger girls and boys doing au-pair, studying or normal work in Berlin. And then some of the smaller fellows were born here and grow up bilingual German and Thai. 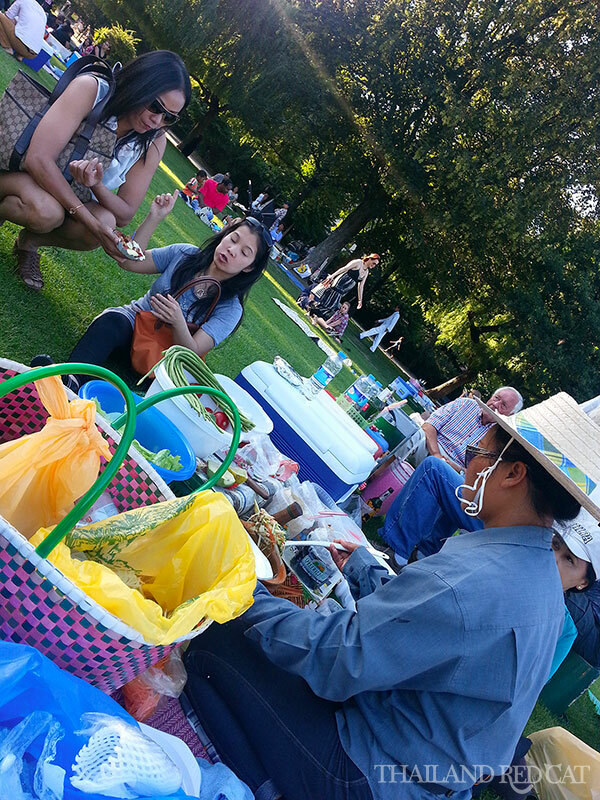 As mentioned already there are lots of Thai people hanging out in this park at any day of the week during summer months but especially on the weekend there are hundreds of Thais around, eating, selling, chatting, playing cards and just having a good time. Actually, it’s prohibited to sell food as well as putting up beach umbrellas in public parks in Berlin. So what’s pretty funny to watch every day at least twice the guys from the regulatory office (Ordnungsamt) are showing up and just before entering the park everyone is quickly starting to put their things together – reminds you of the famous market along the railway in Bangkok. But then again, this is not Bangkok, not Thailand – this is Berlin, this is Germany. The “Thai Park” in Berlin-Wilmersdorf can be easily accessed by public transport: Get off Wilmersdorfer Straße U-Bahn Station (U7) and you are virtually right in front of the northern entrance of the park, the side where the Thais are hanging out. Why are Bangkok People so... different?